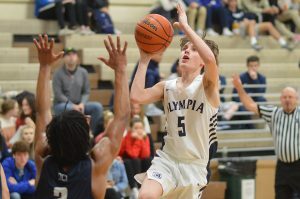 Just two days removed from seeing an opportunity to claim the 4A South Puget Sound League championship slip through their fingers, the Olympia High School boys basketball team could have come out flat for its second-place tiebreaker against league rival Puyallup. Instead, like they’ve done multiple times this season, the Bears showed their resilience by responding to the setback with a big victory. Kai Johnson scored 18 points, Andrew Lindsay added 13 and Olympia secured the SPSL’s No. 2 seed into the 4A West Central/Southwest District tournament with a 64-58 win over the Vikings. Up next for the Bears (14-7) will be Kentwood, the third-place team out of the 4A North Puget Sound League. 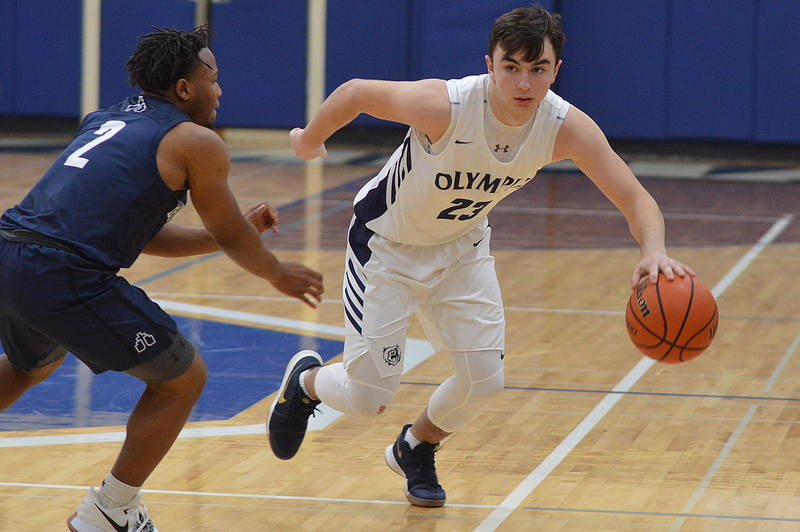 Olympia will host the Conquerors (12-9) on February 6 with the winner advancing to play either undefeated Union (20-0) or Sumner (10-10) in the quarterfinals on February 9 at Mount Tahoma High School. The top seven teams from the district clinch berths into the regional round of the state tournament. Semifinals will be held on February 14 at Mount Tahoma, while the championship game will take place on February 16 at Puyallup High School. The Bears entered the last day of the regular season tied atop the league standings with Curtis. Had both teams won their final contest a league championship matchup would have taken place. Curtis (16-4) knocked off Rogers of Puyallup, 68-53, to hold up their end, but Olympia stumbled against Graham Kapowsin, a team the Bears had defeated by 30 points earlier in the season, losing 73-66 and falling into a tie for second place with Puyallup. 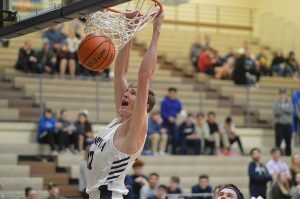 A shot at a league title or even the second seed looked bleak in mid-January for the Bears as they suffered through a rare three-game losing skid, dropping games to Puyallup (62-61), Sumner (45-42) and Curtis (69-61). 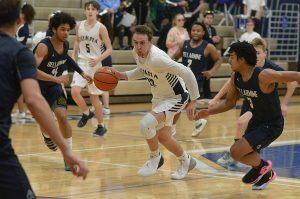 Olympia got right back into the playoff picture by winning its next three games, knocking off Emerald Ridge (68-43), Puyallup (60-55) and Bellarmine (51-34). The Bears are paced offensively by sophomore Jackson Grant (13.6 points per game), juniors Johnson (12.1) and Ethan Gahm (9.9) and senior Lindsay (9.5). Olympia’s first-round game against Kentwood is a rematch from its district opener against the Conquerors last year. Kentwood won last season, 69-55. The Bears were led by Grant’s 15 points in the loss. 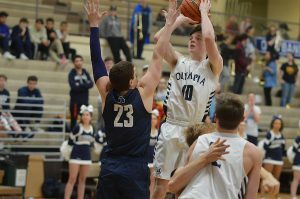 Olympia followed the defeat by winning its next two loser-out games at the district tournament before falling a game shy of securing a trip to regionals. The Bears last advanced to the regional round of the state tournament in 2012. Capital and Timberline will head into the 3A West Central/Southwest District boys basketball tournament as co-South Sound Conference champions. The Cougars, who will take a 16-game winning streak into the postseason, enter the playoffs as the conference’s No. 1 seed, while the Blazers (15-5) are the second seed. The two teams split their two regular season meetings this year with each winning in dramatic fashion. The Cougars, who will take a 16-game winning streak into the postseason, enter the playoffs as the conference’s No. 1 seed, while the Blazers (16-5) are the second seed. The two teams split their two regular season meetings this year with each winning in dramatic fashion. Timberline won the first battle, 56-55, on December 7 on senior Hunter Campau’s driving layup with 1 second remaining. Capital (18-2) got revenge in the rematch after senior Chris Penner hit a buzzer beater in overtime to give the Cougars the 56-54 triumph on January 16. Capital claimed the conference’s top seed due to head-to-head point differential. The Cougars, who have lost two games this year by a combined two points, will host the winner of Mount Tahoma/Gig Harbor on February 8 to open district play. Timberline, which finished fourth at last year’s state tournament, will host either Stadium on February 6 or play in a quarterfinal game at home on February 8 depending on the outcome of its seeding game against 3A Pierce County League runner-up Wilson. The Blazers have advanced to the regional round six consecutive years.